The AV-1010-B is a voltage pulse generator capable of generating ±100V into 50 Ohm loads, with less than 10 ns rise time. If a laser diode is inserted in series with the 50 Ohm resistance, the instrument acts as a ±2A current source with 50 Ohm output impedance. This method of pulsing a diode has the advantage that the 50 Ohm resistor can act as a termination for a 50 Ohm transmission line. This is illustrated in Figure 1. 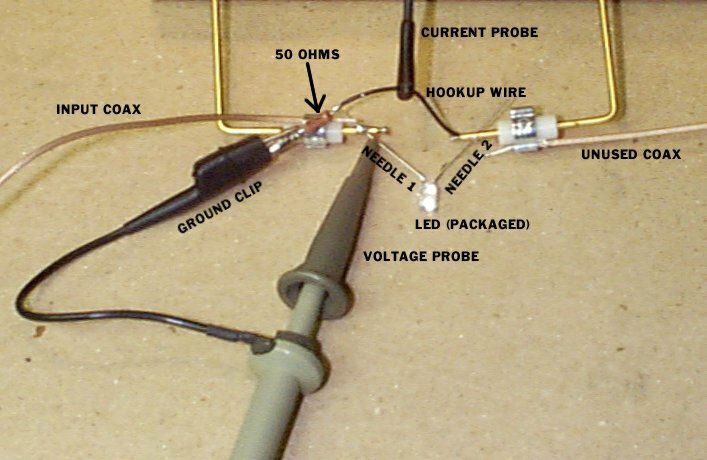 By using transmission line techniques, the diode under test can be located several feet away from the instrument, without incurring the large inductive voltage spikes that would normally be present. This basic technique, and other current pulsing techniques, are described further in Application Note 3A. This technique works well when driving packaged diodes, because the diode and the terminating resistance can be made into a relatively compact circuit, without adding too much series inductance. However, some end-users need to test unpackaged diodes in probing stations. Getting fast current pulses into the probing station can be a challenge, because relatively long lengths of cable, and several inches of probing needles, are present. However, since most probing stations have provision for feeding in 50 Ohm coaxial transmission lines, the technique described above can be used with a good degree of success. The bottom trace is the voltage across the 50 Ohm resistor, and the top trace is the output of the current transformer. The current transformer introduces a small amount of overshoot into the waveform. This photo tells us that the best current waveform that we can achieve, with an ideal termination, has perturbations on the order of 3% (this includes the current transformer's contribution). This is a less ideal termination for the transmission line, so it is not surprising when higher overshoot is observed on the output waveforms, shown below. The increased overshoot may also be partly due to the turn-on transient of the diode. Also, due to the high forward voltage of this experimental diode (around 20V! ), the output current has fallen from 2A to 1.6A (i.e., 100V-20V / 50 Ohms = 1.6 Amps). This waveform photo establishes that the best current waveform that we can expect in a probing station will have ringing/overshoot of 10% or so. The next test establishes that we can in fact obtain this performance in the probing station. The circuit diagram shows the a 2 foot coaxial line is used to connect to the first probing needle, which contacts the diode anode. The cathode is contacted with a second needle, which in turn, is connected to the 50 Ohm terminating resistor via a 2" length of 24 AWG hookup wire. This wire is also fed through the current transformer. The 50 Ohm resistor is soldered directly to the shield of the coax input. Despite the presence of the 2" of hookup wire, and approximately 2" of needle length, the waveform is as good as it was under the best-possible diode plus terminating resistance scenario illustrated previously. It is possible to deliver relatively clean and fast current pulses to a device under test (DUT) in a probing station, if a voltage pulse generator is used to drive the DUT with a 50 Ohm series resistance, and if 50 Ohm coaxial cables are used. In the example presented here, an AV-1010-B was used to deliver a 1.6 Amp pulse with rise times less than 10 ns to a blue output light emitting diode (LED).